This shop is one of the most popular Awamochi shop in Japan. Located in the famous Kitano Tenmangu Shrine, people have been enjoying Awamochi at this location since the Edo period (1603 – 1868). An appropriate shop for a city rich in history, “awa” is made out of millet, a grain that was once a major staple diet in Japan. This well-known Awamochi shop is currently run by the 13th generation owner. “Awa itself is not so tasty,” the Awamochi maker tells us, “that’s why Awamochi is being created in mochi form to consume it in more pleasurable way.” An enchanting way of eating “awa,” an order comes with both red bean wrapped and Kinako covered Awamochi. Awamochi is freshly made right at the counter by the entrance. Awamochi makers rapidly roll out the Awamochi one by one in a perfect ball shape, the process is very intriguing to watch. The round ones are covered with smooth red bean paste called “koshi an” the entire balance of sweetness and smooth texture makes these Awamochi very easy to eat. The log-shaped ones are covered with Kinako, a powder made out of roasted soy beans. Having two different types of Awamochi satisfyingly accents the Awamochi eating experience. Kinako is mixed with sugar and is tasty even just by itself. Enjoy the texture and the roasted flavors of delicious Kinako. Can’t go wrong with Matcha and Japanese confectioneries together! Slightly bitter green tea taste goes well with sweet Awamochi, an traditional way of having a tea break. Awamochi is often ordered to-go by the locals, however we recommend eating-in because of the short shelf life they have. Awamochi must be eaten on the day they are made since Awamochi will lose its softness. There are only two choices, 5-piece plate (￥600) or 3-piece plate (￥450). 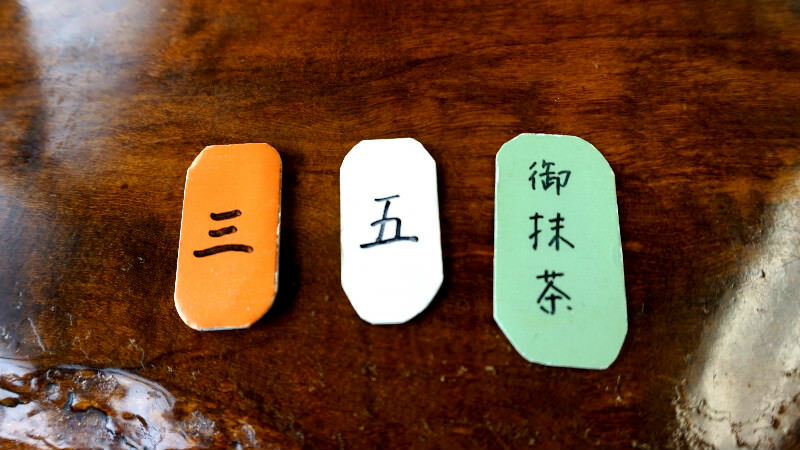 When your order arrives at your table, they will also hand you with tags which identifies your ordered items. Take these to the register on your way out to pay for your order. This is a long established Japanese sweets café in front of Kitano Tenmangu Shrine. It's tons of fun to watch the chef of the establishment skilfully make mochi with anko bean paste and kinako roasted soybean flour. 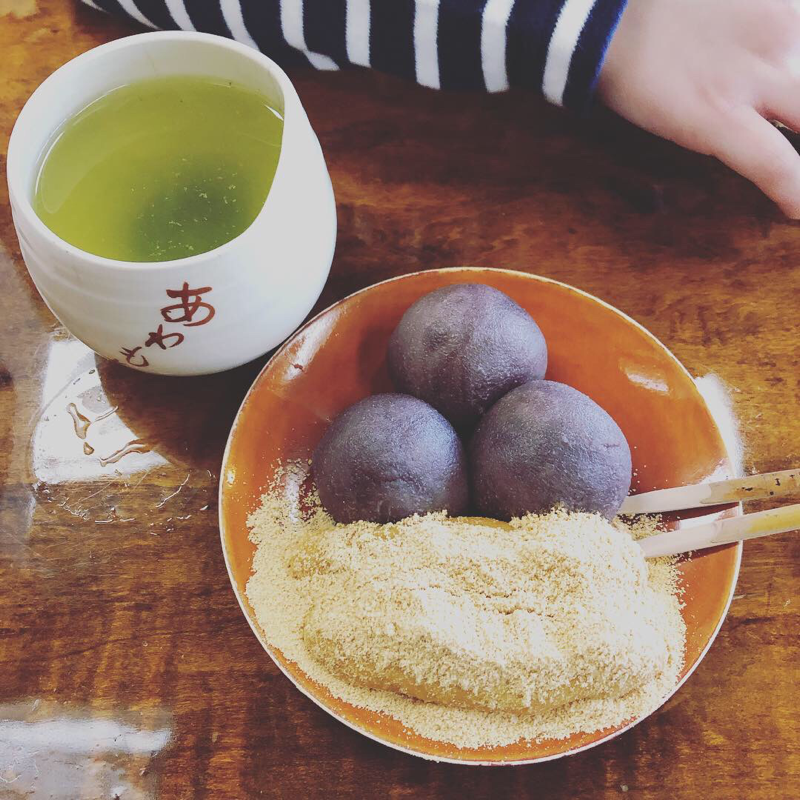 The red bean paste in their chestnut mochi is sweet but not too sweet so it feels like I could eat quite many of them. 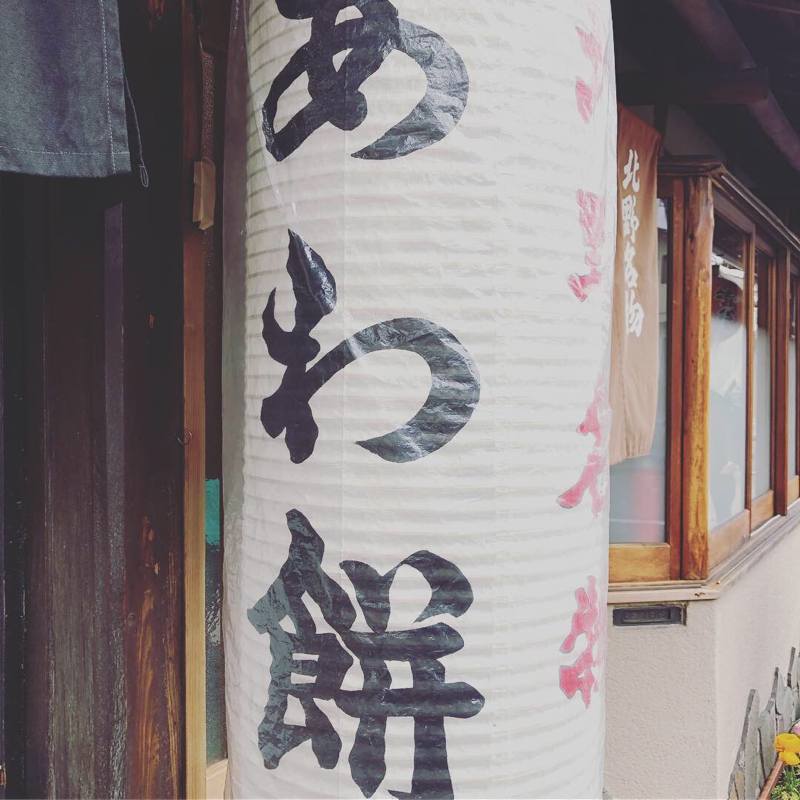 If you come to Kitano Tenmangu Shrine please also visitit this Japanese cafe.